This FREE LeCharm Tea Sample Is Just In Time For St. Patrick's Day! You are here: Home / food / This FREE LeCharm Tea Sample Is Just In Time For St. Patrick’s Day! This FREE LeCharm Tea Sample Is Just In Time For St. Patrick’s Day! Do you love drinking tea? 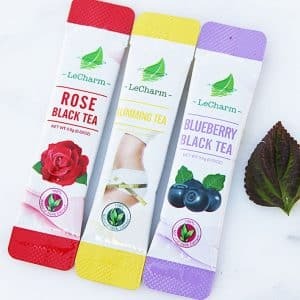 Make sure you check out this freebie offer for a sample of LeCharm tea! You can currently select from 8 different flavors of tea. Choose your FREE tea samples based on your favorite flavors. The available tea flavors include the following: Rose Black Tea, Slimming Tea, Lotus Leaf Tea, Peach Iced Green Tea, Detox Tea, Jasmine Green Tea, Blueberry Black Tea, and Ginger Tea. So, are you excited to get your FREE LeCharm tea extract? Simply visit this website and click on the link listed below the photo of the tea. Then, click on the green ‘add to cart’ button. Next, select your tea flavor in your shopping cart. This tea is free from sugar and is 100% natural.